Sewn By Hand Book Review - Loved This Book! 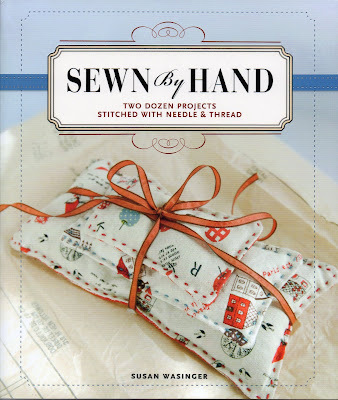 Sewn by Hand, by Susan Wasinger and published by Lark Crafts, is a delightful book of two dozen projects to be stitched with needle and thread. The projects are varied to suit many interests and styles. The inside front states: unplug sewing from the machine and make 24 super-cute projects the slow crafts way: by hand. Sewing without electricity is fun, eco-friendly, and mobile, allowing everything you stitch to tag along to cafes, on trips, to sporting events, and to other social occasions the way knitting and crochet projects can. The layout of the projects makes it easy to determine the level of skills needed, the portability of the materials, the required materials and tools. Templates are included as well. My first project will be the Sewing kit for on-the-move stitchers. The author states :"This clever little kit carries all the tools-of-the-stitching-trade. Even better, the very making of it teaches you all the stitches a competent hand seamstress will ever need. It's a tiny treasure (5 x 7 inches closed, 11 x 13 open) that holds your gadgets, your notions, and a good bit of your stitch wisdom, too." Looks like the perfect way to stay organized with my hand sewing needs on trips and moving from studio to living room sewing. Practical but a fun project as well. The project on the cover, Owie Puffs for Boo-Boos, is perfect for a new baby gift or the loved grandchild. It consists of 3 sizes of thermal packs to soothe little ones' bumps and bruises. The author, Susan Wasinger (who was taught to sew at age four by her couture-trained grandmother) reveals simple embellishments and embroidery techniques that will give your work designer style. 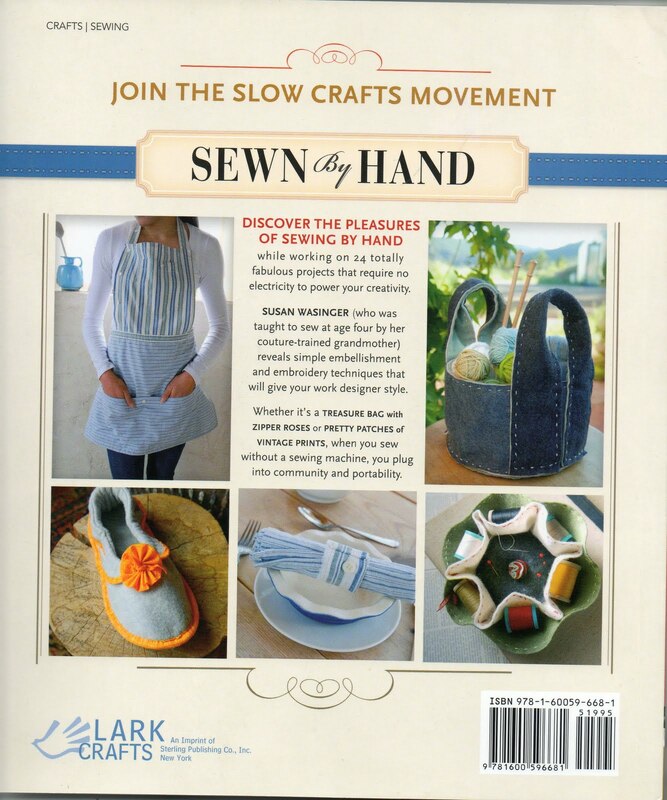 This book is the perfect way to join the slow crafts movement. When you sew without a sewing machine, you plug into community and portability. It was a great pleasure to read this book and to contemplate the different projects. I recommend it heartily.